In February 2018 I was approached by ASOS’ Culture Marketing Team and offered a position as an ‘ASOS INSIDER’. 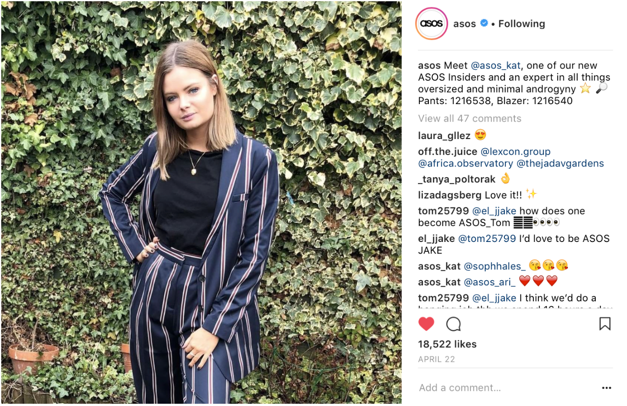 This means I am a freelance Brand Influencer for the company, with my own dedicated Instagram account ‘ASOS_KAT’ with over 64 thousand followers, I post looks daily featuring the latest ASOS products. I am also the bridge between the brand and its customers, answering queries, giving style advice and delivering customer feedback on products straight to the buying teams at Head Office.